Viruses are the smallest obligate intracellular infectious agents containing only one type of nucleic acid, either DNA or RNA as their genome. They are Living Chemicals. Size: The size of viruses range from 20 to 400 nm in diameter. The simplest natully occuring infective virion consists of a nucleic acid genome packaged into a protein coat. 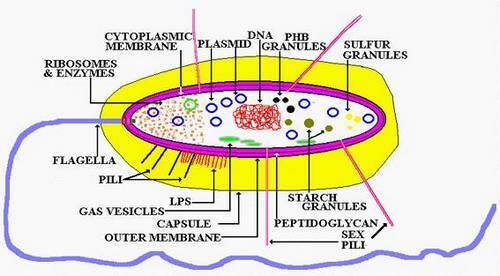 Some viruses have an additional protective layer, the envelope. Viruses without an envelope are known as naked. a. The genome contains either RNA or DNA. b. The nucleic acid can exist as a single stranded virus (RNA viruses except reovirus) or as a double stranded (DNA viruses except parvo-virus). c.	The genome can be linear or circular. 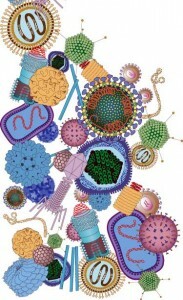 Most viruses posses linear genomes except papova-virus which contains a supercoiled circular genome. d.	Infective DNA genome is translated by cell polymerase into mRNA and infective RNA genome is translated directly into protein by cellular ribosomes. b.	mediates viral adsorption to and penetration of cells through interactions with receptors on cell membranes. Capsid may have icosahedral or helical symmetry. a.	Icosahedral nucleocapsids: The icosahedral capsids are of two types, pentagonal capsomers at the vertices and hexagonal capsomers at the facets. Icosahedral capsid is most stable. Icosahedral viruses are mostly naked and spherical. eg: papova, herpes, retro viruses. Some viruses like pox virus show neither of symmetry but complex symmetry. eg: Influenza virus consist of 2 kinds of peplomers. 4. Shape: Most of the animal viruses are spherical, some are irregular and pleiomorphic. 5. Resistance: Most viruses are heat labile. They are inactivated by sunlight, uv rays and ionizing radiation. They are more resistant to chemical disinfectant compared to bacteria.